Last summer we spent some time in the Black Hills of South Dakota. We didn’t have time to do a lot of sightseeing, so when we did, we wanted to record it. Using an App called My Tracks on my Android smartphone, I made this map simply by tapping on a button to Record when we started, and a tap on Stop Recording when we finished. I like having this map to put into my blog for the detail it gives of our little trip. I can easily take a screen shot of it so I have a picture of the route in the blog post, or I can go to the website and grab the embed code to have an interactive map. If you click on the link for “View Larger Map” you will get to a Google Maps screen where you can zoom in and out to see all the detail that Google Maps offers, complete with the layers options of photos, and even webcams. I also turned the My Tracks recorder on at another time, when we took our kayaks on a paddle near the mouth of the Peace River. We were with a group (from Riverside RV Park) who knew where to go when the river developed lots of side channels. Now, with this map, we could recreate the trip on our own without fear of getting lost! 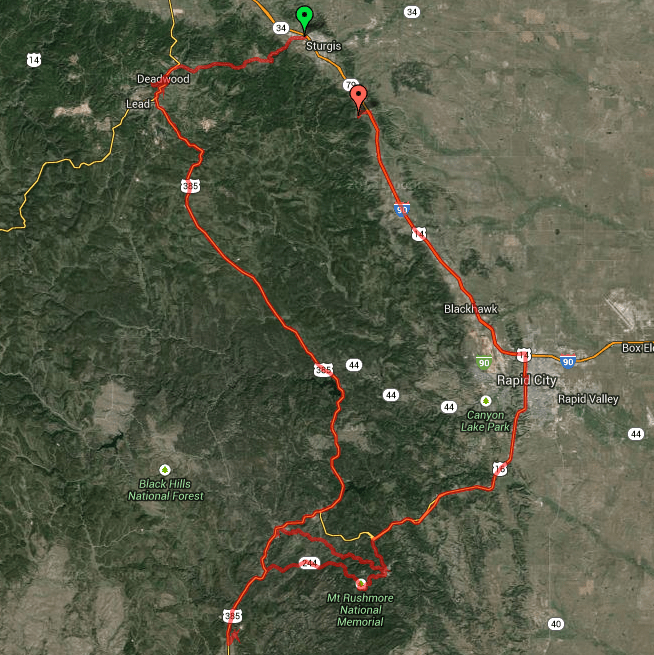 My Tracks is a Google product, so it integrates with Google Maps, Google Earth, and Google Drive. If you use Google Drive your Tracks are automatically saved there, so you can access them from your computer, or whatever device you like. This also makes them easy to share with others. After you record a track, you should be able to open your Google Drive and see a folder called My Tracks. This folder can be on your computer as well as in the cloud if you download the Google Drive Desktop. Simply clicking on a Track will show you the track on a map – a Google Map! From there you can change the view to Satellite. I did a little searching and came up with this app that does something similar to My Tracks and is available on both iPhone as well as Android. It’s called EveryTrail, and it looks quite nice. I downloaded the free version on both my Android phone and my iPad. Note that there is not an iPad specific app, you need to install the iPhone App. Just like My Tracks, you simply tap a button that says Start Tracking. When you’re finished, you tap the Pause button and then you’ll see ‘Finish’ and the option to Save the Track to your account. 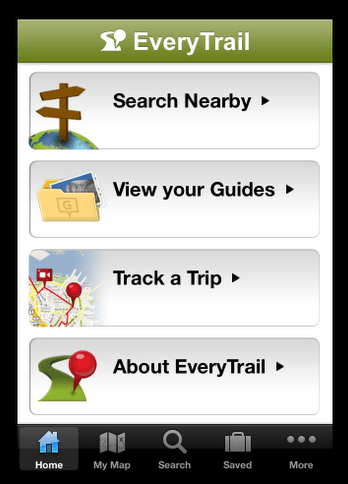 You can then access any maps you’ve saved by visiting the website and logging in, or with any other devices where you’ve downloaded the EveryTrail App. One feature I really like about EveryTrail is the ability to take a picture at any spot along your route and it will become a marker at that spot. You can even add pictures later to fully annotate your route. If you get the pro version for $3.99 you can add videos as well. For special trips, you might want to add some text to complete your story. This is a great app for You can use it anytime you’re moving, whether you’re riding in a car, on a bike, walking, paddling, or roller skating, EveryTrail can track your route, save it, and share it. It even has lots of suggestions from routes shared by other members. If you want to track routes for the purpose of logging your exercise, both My Tracks and EveryTrail can do it, but I like to use Runkeeper for that purpose. Runkeeper is an App available for both Android and iPhone and it is specifically intended to help us get fit. You can set goals for your exercise, be it running, walking, biking, kayaking, or swimming. As we walk (you won’t catch us running!) we have it set to talk to us every 5 minutes, telling us how far we’ve come and what our average pace is in miles per hour. Just the fact of having this turned on makes us walk faster! Runkeeper can be set up to communicate with all sorts of other devices as well. We use it to connect via bluetooth to our weigh scales, and also to a calorie counting app called MyFitnessPal. So, in one place – Runkeeper – we have a log of our exercise, calorie intake, and weight. With special heart rate monitors, you can deliver accurate, real-time heart rate data to your RunKeeper App to track your performance. Runkeeper produces the same kind of maps that My Tracks and EveryTrail does, complete with photos. I haven’t used Map My Ride, but I include it for the bicyclers in the audience. It is quite popular among cyclists and has gathered thousands of suggested routes. You can also find biking groups and events to join, as well as the basics of creating maps along your route. Published by MrsGeek, in Blog. Tagged with Android, GPS tracking maps, iPad, Smartphones. No – you don’t need connectivity for MyTracks to work. When you lose connectivity to the Internet, it is still receiving GPS signal and tracking the coordinates of where you are. What’s missing is a map because that comes from the Internet. But, once you get connectivity back, your track will be on a map.